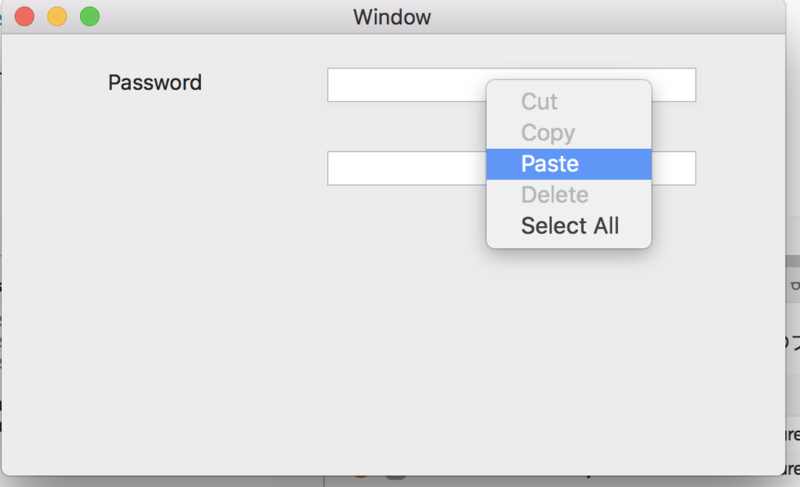 How to disable a paste menu in Secure Text field. I'd like to know how to disable Paste in Secure Text field. I created custom secure text field and custom secure text field cell as below. But, I can not handle the context menu and paste from menu at all. Do you have any hint to disable this? I'd like to disable this menu. You have a few solutions, you need to create your own SecureTextField and in Xcode set name of your class. Unfortunately, both your suggestions doesn't work. Option 1: Menu is null at constructor. Option 2: ValidateMenuItem() is not called at all. Oh. Do you mean we have no way to control context menu on SecureTextField ? In this topic says every NSTextField and NSSecureTextField has NSTextView with context menu which you showed in screen, and NSTextView control context menu, I do not know how get NSTextView. I found only property CurrentEditor which return NSControl may be that it is. I confirmed CurrentEditor. It's NSText object. When I remove CurrentEditor.Menu Items, Text field menu is disabled. But SecureTextField is still there. Unfortunately, I can't disable context menu on SecureTextField yet.